Hannah Barlow is one of Royal Doultons most popular and most collectable artists. 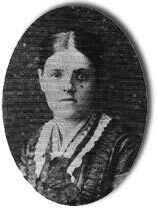 Hannah Barlow was one of two Barlow Sisters employed at Doultons London factory. An expert tube liner, Hannah Barlow’s pieces are amomg the most sought after of all Doulton artist designs. Hannah produced her renowned animal designs and her sister Florence produced floral studies for nearly forty years. The two women were prominent in the field of decorative arts long before Clarice Cliff or Susie Cooper, yet they are only now being recognised outside the Royal Doulton circle of collectors. Charles Edward, Alice Jane, Arthur Bolton (1846-1879), Benjamin Iram, Frances Louisa, Lucy Anna, Hannah Bolton (1851-1916), Herbert John and Florence Elizabeth. 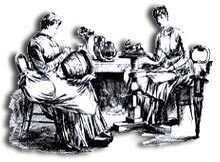 In 1871 Hannah Barlow, along with several other students (including her brother Arthur) were initially employed by the Doulton Lambeth pottery to decorate salt glazed stoneware. Eventually, Hannah was joined at Royal Doulton by her sister Florence. The girls almost immediately decided, between themselves, that Florence would paint flowers and birds and Hannah would concentrate on horses and other animals. Despite losing the use of her right hand she was able to use her left hand just as proficiently and became one of Royal Doulton’s most prolific artists. Hannah Barlow decorated the animalia band around the vases and left the remaining decoration to other designers and assistants. Her output was considerable and she would often produce 20 top quality vases per day. Each of her pieces was first drawn as a sketch then incised into the wet clay before firing. However, this method of production was time consuming, labour intensive and costly. In 1913, Hannah Barlow retired having stayed at Royal Doulton, producing quality Art Pottery for over forty years. Examples of Hannah Barlows work. The various illustrations show examples of Hannah Barlow’s fine work featuring her favourite subjects, british farm animals. Decorative vases produced by Hannah Barlow in the late 1890’s, sell today for around £1,000-£2,500 depending on condition. 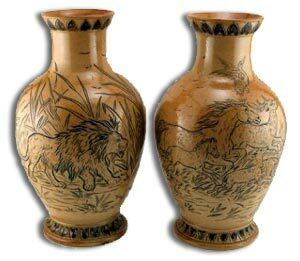 The nineteen inch vase on the left was produced at Doulton’s London works around 1895 and sold at auction in mid-2006 for £1850.00. 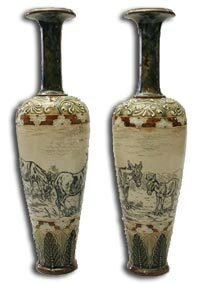 The matched pair of sixteen inch baluster vases on the right sold at auction in early 2006 for £2200.00. Hannah Barlow marked all her wares with a distinctive monogram, that is easily recognised once you have seen it. However, the style and quality of her work shines through even when the monogram is missing or illegible. 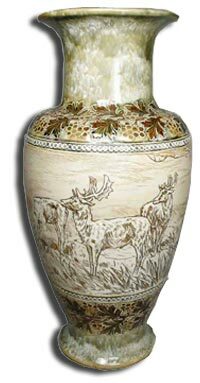 Hannah Barlow Collectables … Serious collectors are buying up every Hannah Barlow piece that comes on to the market, whether in local, national, international or online internet auctions. You can therefore, expect her work to become very rare and for prices to increase exponentially. Hannah Barlow’s pieces are fast becoming a sound financial investment that will hold their value long after other artists work has floundered and died.